The so-called automatic mascara, which is not automatic in the sense that it does nothing on its own, essentially has the character of an automatic mascara;This means that the product can be applied directly to the lash with an applicator. The main new feature will be this applicator, which comes in the form of a waterproof and non-porous container, and consists of a tip on which you will find either a brush or a device for applying the product. The development of this product will lead to a very specific initial segmentation. There will be on one side what is called water-based mascara as opposed to waterproof mascara. This coexistence comes from the very process of its development. Indeed, the applicator assumed the use of a pasty product. Some chemists have simply reproduced the gesture of using the reference product, i.e. diluting the mascara cake (coloured soap bar) with water. This formed a cream which, put in the applicator, gave satisfactory results. Others were interested in another form of cream product, waxing, similar to the old Vaseline mascaras. It turned out that the results were equally satisfactory from a functional point of view. 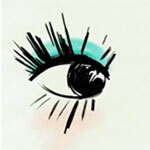 Both forms of mascara were born! They still coexist, and have been joined by some variants. From the point of view of formulation, therefore, two types of formula can be distinguished: - water-based products, which consist mainly of continuous aqueous phase anionic emulsions, - waterproof products, consisting mainly of wax solutions in solvents, and/or continuous oil phase emulsions. These two original products, the so-called water-resistant mascaras, and a much more recent variant, the waterproof mascaras made from formulas with a continuous aqueous phase, have been added to the range. These are mainly formulas based on soaps made from in situ from fatty acids, neutralized by organic bases. These formulas contain a significant proportion of waxes in the fatty phase, whose role is to sheath and thicken the lash. The proportions are close to the following composition: - Aqueous phase: 50%. - Fat phase: 40 to 45%. - Pigment phase: 5 to 10%. The proportion of soap is between 5 and 10%. The aqueous phase is the site of the pigment dispersion, as well as the presence of filmogens to fix make-up. One of the main difficulties of formulation is to adjust consistency and rheology to the type of applicator. This is done by controlling the viscosity, but also the"wet effect of the formula" which is quite specific to this type of product. Soaps of fatty acids and alkanolamines are found at the base of these formulations. Fatty acids are mainly palmitic or stearic. The neutralization was initially carried out by triethanolamine, but it will gradually be replaced by other alkanolamines following the regulatory provisions setting the conditions of use of these substances. Alternative amines will be Tris-aminomethane, aminomethylpropadiol or aminomethylpropane. The soap concentration is strong enough, between 5 and 10 % to allow an easy and fast make-up, among others by supporting the adherence of the product on the lash. Indeed, they are aqueous products, whereas the lash, like all dander, has a marked hydrophobic character. For rapid transfer, therefore, substances with a high wetting capacity must be used. Soaps fulfil this function perfectly and have been the basis for formulating these products for many years. The nature and presence of a high soap concentration will also give this preparation a relatively high pH. These different points will lead some formulators to develop formulas based on anionic surfactants to regulate the pH while reducing or even eliminating the presence of soap. These substances are almost essentially esters of fatty alcohols and neutralized phosphoric acid, the neutralization being done beforehand (Na, K) or being made in situ . An alternative to anionic formulation is the use of nonionic surfactants, such as glutamate esters or stearic esters (glycerol esters). These are mainly soft waxes, such as beeswax, and in some cases palm wax (Carnauba) or rice wax to harden the film formed on the lash and improve its strength. We also note the frequent presence of low molecular weight paraffin (PG : 50°C-60°C), whose role is to increase the dry extract in waxes to thicken make-up, without significantly affecting the viscosity, key factor of the formula/applicator couple. The use of hard waxes (Ozokerites for example) would make this operation almost impossible. A particularity consists in certain cases in the use of very liquid wax emulsions, called"wax milks", to preserve the sheathing effect of wax, without having the viscosity properties. The formula can be completed with different elements, and some additives such as antioxidants. It should be noted, however, that formulas rarely contain liquid oily substances. This characteristic would weaken the film formed on the surface of the eyelash, causing sub-orbital marks or on the brow arch, this being considered a major defect. The historical use of castor oil, which will give rise to a famous product in this family (Ricil), will however be remembered, but this vegetable oil with particular properties has no functional reality in mascara formulas. Filmogens: often composed of Shellac (shellac) in the past, neutralized with TEA, they are now often synthetic polymers like PVP, different types of acrylic polymers, totally or partially neutralized, or, in some cases, polymer dispersions like polyurethane (better water resistance). The control of viscosity and wet effect is addressed by the combined use of two substances: a gum to control viscosity, sodium CMC or xanthan gum, and a specific type of gum, more related to mucilages than to viscous gums. The main representative is gum arabic (Acacia gum). Indeed, this gum has the property of being soluble in high concentration in water, without viscous the solution. This property thus makes it possible to structure the aqueous phase in a specific way. Cationic filmogens: these are quaternized cellulose or cationic polymers of the Polyquaternium 10 type. Water, Paraffin, Stearic acid, Triethanolamine, Acacia senegal, Beeswax, Carnauba wax, Simethicone, Sodium polymethacrylate, Hydroxyethycellulose, Panthenol, Polyquaternium-10, Imidazolidinyl urea, Methylparaben, Propylparaben, May contain: Mica, Titanium dioxide/CI 77891, Carmine/Ci 75470, Iron oxides/CI 77491, CI 77492, CI 77499, Chromium hydroxide green/CI 77289, Chromium oxide green/CI 77288, Ultramarines/CI77007 . Water, Paraffin, Stearic acid, Cyclomethicone, Acacia, Carnauba wax, Beeswax, Triethanolamine, Sodium polymethacrylate, Cornflower extract, Panthenol, Bisabolol, Hydrogenated jojoba oil, Palm oil, Trioroxypalmitamidohydroxypropyl myristyl ether, Hydroxethylcellulose, Dimethiconol, Ammonethyl propanediol, Imidazolidinyl urea, Polyquaternium-10, Methylparaben, Simethicone, Propylparaben. May contain: Carmine, Chromium hydroxide green, Chromium oxide greens, Mica. Water (Aqua), Paraffin, Acrylates copolymer, Beeswax (Cera alba), Stearic acid, Carnauba wax (Carnauba), Palmitic acid, Triethanolamine, Phenoxyethanol, Aminomethylpropanediol, Hydroxyethylcellulose, Acacia senegal (Acacia), Titanium dioxide (CI 77891), Rayon, Panthenol, Ethylenediamine/Stearyl dimer dilinoleate copolymer, Methylparaben, Sodium dehydroacetate, Hydrogenated jojoba oil, Hydrogenated palm oil, Disodium EDTA, Ethylparaben, Simethicone-2, Oleamido 1,3 octadecanediol, Isopropylparaben, Butylparaben. Water (Aqua), Isododecane, Ethylenediamine/Stearyl dimer tallate copolymer, Cyclomethicone, Kaolin, Stearic acid, Stearamide MEA, Ammonium shellacate, Polysorbate 20, Silica, Sorbitan tristearate, Glyceryl stearate, PEG-100 stearate, Magnesium aluminium silicate, Hydroxyethylcellulose, PVP, Tocopheryl acetate, Acacia senegal (Acacia), PTFE, Coffee arabica seed extract, Pantothenic acid, Polypeptide, Hydrolyzed jojoba protein, Silk aminoacids, Aminomethylpropanediol, Propylene glycol, Tetradibutyl pentaerithrityl hydroxyhydrocinamate, Isopropyl alcohol, Disodium EDTA, Chlorphenesin, Sorbic acid, Phenoxyethanol, Methylparaben, Butylparaben, Ethylparaben, Propylparaben, Isopropylparaben. May contain: Iron oxide (CI 77491, CI 77492, CI 77499), Mica, Titanium dioxide (CI 77891), Carmine (CI 75470), Chromium oxide green (CI77289), Chromium oxide greens (CI77288), Ultramarines (CI77007), Ferric ferrocyanide (CI77510), Bronze powder (CI77400), Blue 1 (CI42090), Aluminum powder (CI77000), Yellow 5 (CI75470), Bismuth oxychloride (CI77163). Aqua/Water, Oryza sativa/rice bran wax, Sucrose stearate, Cera carnauba/Copernica cerifera wax, Cera a/Beeswax, HDI/Trimethylol hexyllactone crosspolymer, Polybutene, PEG-120 Methyl glucose dioleate, Cetyl alcohol, Stearyl alcohol, Hydroxyethylcellulose, Polyquaternium 40, Caprylyl glycol, Methylparaben, Panthenol, Propylparaben, Cellulose, Dipropylene glycol, Glyceryl caprylate, Silica, Dimethicone, Phenoxyethanol, Ethylparaben, Butylparaben, Tocopherol, Isobutylparaben. Aqua/Water, Paraffin, Potassium cetyl phophate, Acrylates copolymer, Cera alba/Beeswax, Copernica cerifera cera/Carnauba wax, Ethylene/Acrylic acid copolymer, Steareth-2, Cetyl alcohol, Acacia senegal gum, Rose extract, Sodium hyaluronate, 2-Oleamido-1,3-octa decanediol, Disodium EDTA, Propanediol, Hydrogenated jojoba oil, Hydrogenated palm oil, Hydroxyethylcellulose, Caprylyl glycol, Panthenol, Ethylenediamine/Stearyl dimer diniloneate copolymer, Sodium dehydroacetate, Phenoxyethanol, Parfum/Fragrance, +/- May contain: CI 77499/Iron oxides. Contribution made by Jean Claude Le Joliff A biologist by training, Jean Claude Le Joliff was a man of R&D for many years. Successively in charge of R&D, then of Research and Innovation in a large French cosmetics and luxury group, and after an experience of creating a research centre (CERIES), he turned to innovation management. He has also been Associate Professor at the University of Versailles Saint Quentin (UVSQ) and remains a lecturer in several specialized courses: ISIPCA, IPIL, ITECH, UBS, UCO, SFC, etc. He is the founder of inn2c, an R&D and Innovation consulting company. Consultant to several international companies, he has actively participated in projects such as Filorga, Aïny, Fareva, and many others. He created the Cosmétothèque®, the industry's first conservatory of crafts and know-how.